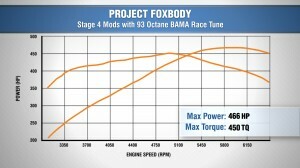 Project Fox Body is back with the same look and a significant boost in power for Stage 4. 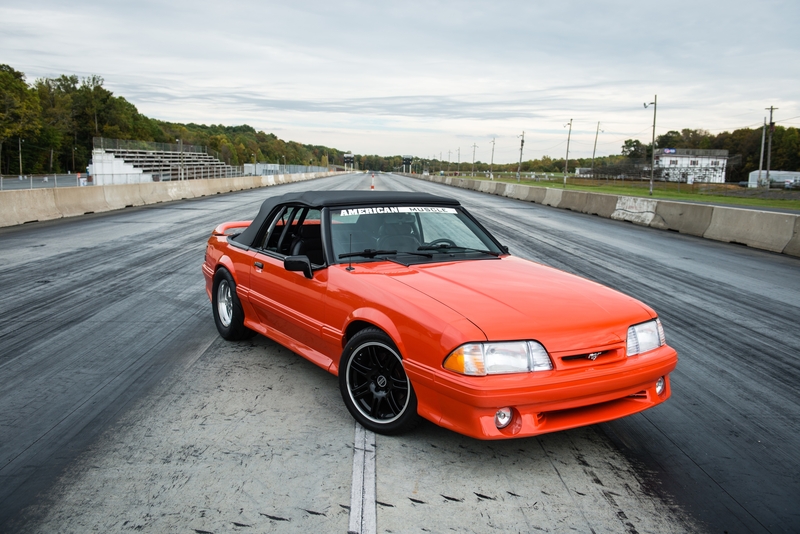 Check out what’s now powering our 450+rwhp one-off 1993 Cobra convertible–a once-upon-a-time junkyard afterthought now converted into a formidable opponent on the street and at the track. As Stage 4 tends to go for most of our project Mustangs, we started things off by brainstorming ways to make serious power by doing what else, but adding boost. We wanted something streetable, a good track performer and certainly something that can be driven on a daily basis. The Vortech V3 Si H.O. tuner kit was the perfect solution for Project Fox Body. It would give us the power we needed for a commendable time slip while also keeping the car fun to drive on the street. Plus, it’s always nice having the centrifugal blower and it’s 7-10 lbs of boost on standby when you “need” to get the Fox up to speed in a hurry or have a set of older tires that won’t quite pass the next round of inspections. Vortech’s kit also included a charge cooler for lower air intake temperatures and came in a newly offered matte black finish that worked well with the less flashy, all business under-hood styling. When you have a Mustang with forced injection that’s going to be making north of 450rwhp, you have a very thirsty toy that’s going to need a significant increase in its ability to deliver fuel. 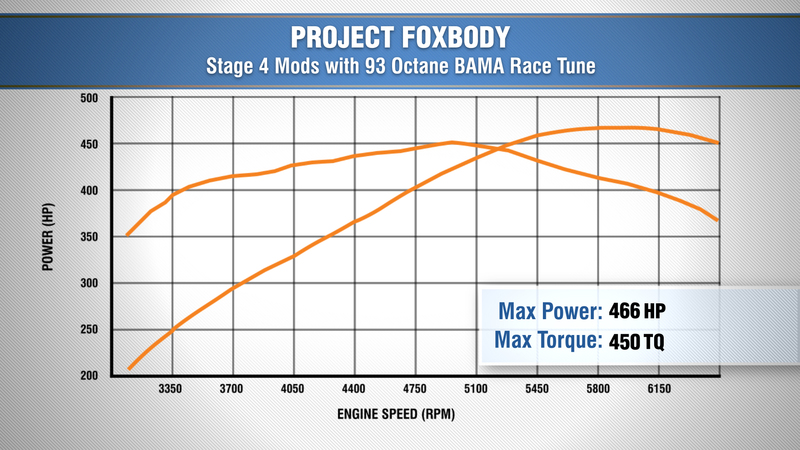 To solve these issues, Project Fox Body was equipped with supporting mods like Edelbrock’s high performance 60lb fuel injectors (compare to the 19lb injectors previously being used) paired with Aeromotive’s high flow fuel rail kit. Braided stainless steel fuel lines, a fuel gauge and monster fuel pump accompanied the shiny new red fuel lines and buttoned up our fuel needs quite nicely. Bama then hooked our 5.0L up with a fresh custom tune. Keeping in mind the bottom end of this motor was still the untouched piece that had come with our junkyard warrior and was pushing past 130,000 miles on the odometer, the tune needed to be precise enough not to break anything. After dialing everything in, Mike Johnston and the rest of the Bama crew was able to squeeze out an impressive 466 rear wheel horsepower and 450 foot-pounds of torque. Not too shabby for a 21 year old car still squeaking by on a stock bottom end. We were then ready to address a few other areas of concern in need of some attention before hitting the track. To adhere to track safety standards we added a cage and 5 point harness as the final touches on what has been an exciting and vastly transforming build. When we picked this car up, it was a safety concern just driving it back to the garage. Now, the concern has shifted from stressing over mid-trip breakdowns to meeting standards necessary for how fast it was going to go in the quarter mile. Quite the transformation for a Mustang that some would have dared to call a lost cause. When we finally got a break in the less than ideal weather we Pennsylvanians see this time of the year, the car shined. We pretty much toasted the stage 1 Exedy clutch we installed back in part 1 of Project Fox Body after just two passes–a good example of why you should always get the proper stage clutch for your build. Despite only getting in two runs, our proud ’93 Cobra convertible churned out a very solid 11.63 @ 120.25 miles per hour. Once the weather clears up and spring comes knocking, we’ll be back with a new clutch to see exactly what this Mustang has left to give. Sooooo……how much did this car cost to build?